It’s never too early to get ahead for next year’s pancake consumption but I am going to class this as pizza coming to you in the form of a pancake rather than pancakes so I’ll scratch all the pancake talk and really if you have an aversion to pancakes (which if you do you might just be slightly crazy) you could use the same toppings on a dough base if that takes your fancy because the flavour combination is all kinds of enjoyable. The best thing about using pancakes as a pizza base, well first off you’re guaranteed a thin base but it’s also lighter than a dough base which is nice because I’m not really a bread eater and it usually makes me feel like there’s an ever expanding sludge monster in my belly. 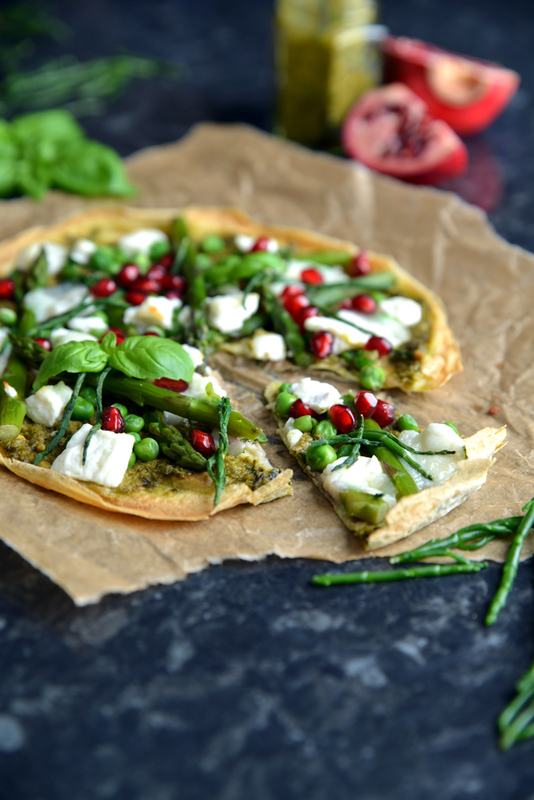 The mix of green veggies in this go so perfectly with the goat’s cheese and pomegranate seeds which by the way I’m obsessed with at the moment, I might have to start planning my meals around my pomegranate seed consumption. 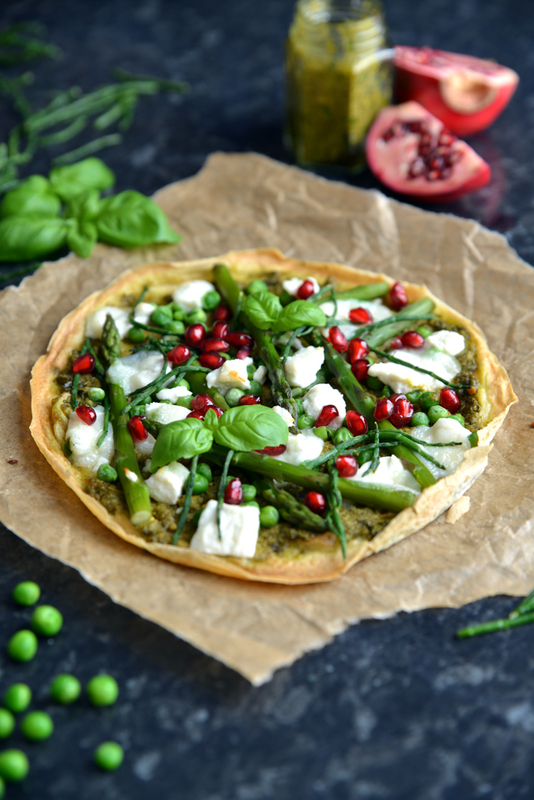 I used garden peas, asparagus and samphire which complement each other rather nicely but if you can’t get those green veggies it can be open to interpretation, broccoli would be a good addition, but the most important thing? POMEGRANATE SEEDS! Do not skimp. I think I might have to start trying them on all pizzas. First make the pancakes, mix the water and milk together and set aside. Sift the flour into a bowl and make a well in the middle, crack the eggs in the middle and whisk while slowly adding half of the milk mixture in until you have a thick mixture. Beat the mixture until no lumps remain then add the rest of the milk and the melted butter. Heat a large frying pan on a medium – low heat and brush with a small amount of butter, add a full ladle of batter to the pan (you want them thicker than a crepe) and cook until the pancake becomes loose, flip then cook again until lightly golden. Repeat this process until all the mixture is gone it should make 3 medium-large pancakes. While the pancakes are cooking cook the asparagus samphire and peas (if frozen). I steamed mine but you can pan fry if easier. 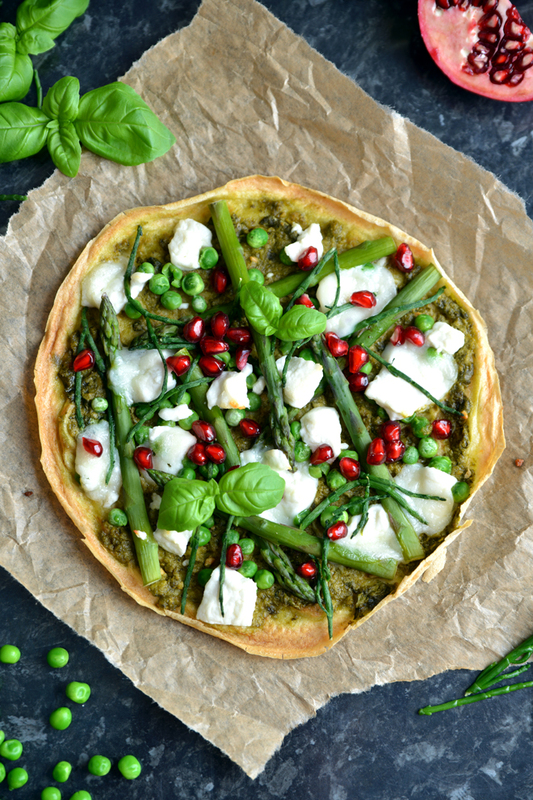 The asparagus takes about 5-6 minutes, samphire and peas 2-3 minutes. 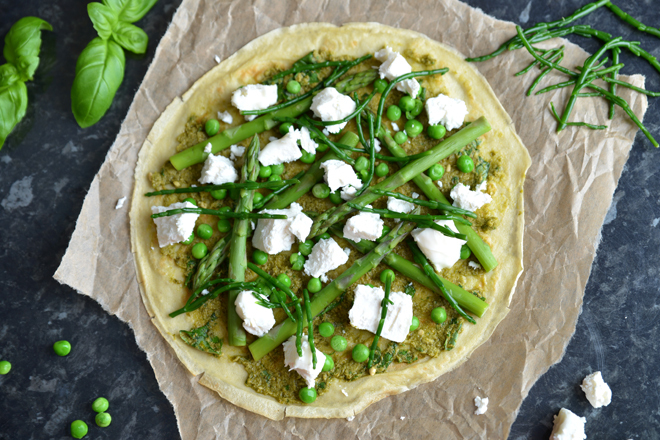 Once the pancakes are cooked place on a baking tray and spread with pesto, top with the cooked asparagus, samphire, peas and goats cheese and place in a preheated oven for 10-12 minutes. 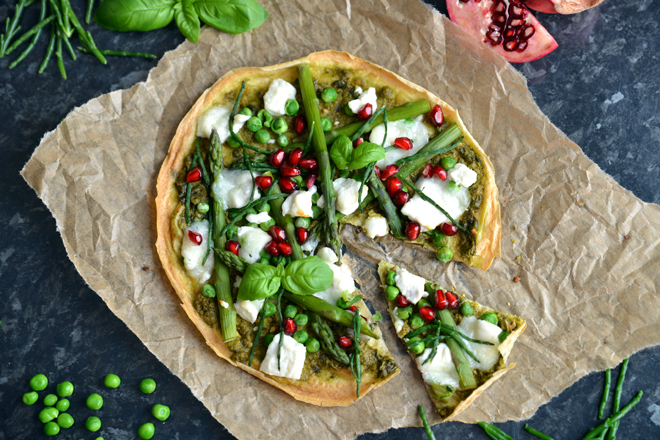 Once cooked top with pomegranate seeds and fresh basil. I have never ever seen a much fresher, greener and so beautiful veggie pancake. I find this a bit fragile, handle with care food but truly worth it.